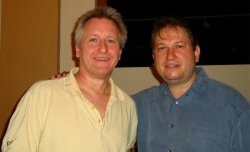 What a pleasure it was to listen to the Kruger Brothers perform in Palm Beach, Florida on April 19, 2009. 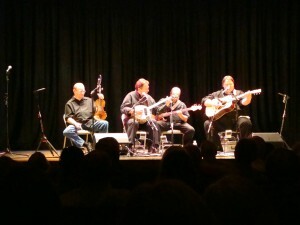 With the Kruger Brothers was special guest Bobby Hicks, who was a former member of both Bluegrass Legend Bill Monroe’s Bluegrass Boys and with the Ricky Skaggs Band in the early 1980s. The first of two sets was performed by Jens and Uwe Kruger and Joel Landsberg. These original tunes were so diverse that it would be difficult to imagine that anyone in the audience would leave this show disappointed. One highlight was an instrumental entitle “Beautiful Nothing”, from the Kruger Brother’s new album, “Between the Notes”. A second set with Bobby Hicks brought to life some traditional bluegrass tunes as well as a big band swing instrumental written in 1923 or 1924 that proved to be a crowd favorite. To think that this concert only cost $10 per person left me wondering if there is any greater bargain for the bluegrass enthusiast. Afterward, I had the chance to meet Jens to discuss his banjo technique. I left with a wonderful impression of Jens as one of the new statesman of modern bluegrass music. Jens was gracious with his time and we have since discussed his banjo playing style and philosophy. I am working on a joint article with the editor of Banjo Newsletter about Jens Kruger, who is quickly becoming recognized as one of the truly great banjo players of all time. Could it be that we also may be planning a joint instructional workshop with Jens and the Kruger Brothers band here in Jupiter, Florida? Stay tuned for details. This entry was posted in Concerts & Festivals and tagged Banjo, Jens Kruger, Kruger Brothers. Bookmark the permalink. Excited about the possibility of the workshop. Hope you can work that out! I am also very excited about the prospect. I have to practice very hard so that I can take full advantage of his instruction. The level of knowldge, dedication and insight into music (not just banjo playing) that Jens has cannot be appreciated until you get a chance to speak with him. He is a true inovator. Shucks, I’ll be stuck on the Cumberland Plateau all summer. Sounds like a great experience coming up for the class. Art – The Workshop is not planned for the summer months. It is planned for late fall or early next year. Stay tune for dates when they become available. The Kruger Brothers are terrific! I’ve been a fan of theirs several years since meeting them at Merlefest. Having attended several of their workshops (short 1-2 hour versions) at various venues leaves no doubt the April 2010 workshop event will be worth every penny! Just saw them at IBMA, they were fabulous. A joy to see and hear. Looking forward to the workshop. I encourage musicians of any genre to attend and learn from the best, as they do not limit themselves to any one category of music and have something to offer everyone. The concert was great! More than great!